Gbegiri soup is a Yoruba (Western Nigerian) soup prepared with beans. 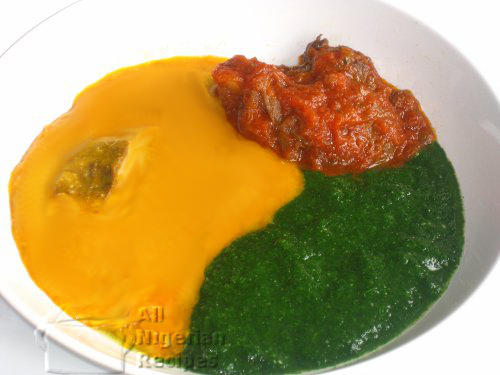 On its own, it looks like baby food but it comes alive when you add Ewedu Soup and meat from your Beef & Chicken Stew. Gbegiri Soup (the yellow one in the image) takes a bit of getting used for those who are not used to eating soup cooked with beans. The combination of the Gbegiri Soup, Ewedu Soup and the stew will surely tease and challenge your tastebuds! Ensure you have some Beef & Chicken Stew because the beef for the Gbegiri Soup comes from this stew. Remove the beans coat and soak the beans for about 3 hours. This soaking makes the beans soft so that it cooks in less time. This way there will be no need to use potash to cook the beans. If you are using peeled and dried beans, you will need to soak it overnight. Prepare other ingredients: pound/blitz the pepper and grind the crayfish. Put the peeled and soaked beans into a sizeable pot. Pour water to cover the beans and start cooking at medium heat. While the beans is cooking, prepare the Ewedu Soup which is used to eat the Gbegiri Soup. Cook the beans till they become so soft that it practically melts when you mash it with your fingers. This takes about 1 hour. You will need to top up the water from time to time but make sure the water is always at the same level as the beans. This ensures that you have just the right amount of water in the soup when the beans is done. When the beans is well done and soft, blend it. It is not advisable to blend hot food in blenders with plastic jugs so if your blender has a plastic jug, seive the soft beans with a sieve that has a mire mesh. Pour the beans into a pot and set back on the stove, add the smoked fish, salt, pepper, crayfish, stock cube and palm oil. Cover the pot and cook at low heat for about 5 minutes or till the oil blends with the rest of the ingredients. This is when the oil changes from red to yellow. Stir from time to time so it does not burn. That's it! The Gbegiri Soup is done. Dish the soup with Ewedu Soup, get the meat from your Beef & Chicken Stew and eat with Amala or any other Nigerian fufu meal.